United States President Donald Trump has announced his planned meeting with North Korean leader Kim Jong Un will take place on June 12 in Singapore. The president wrote on Twitter “We will both try to make it a very special moment for World Peace!” The meeting would be the first between a sitting U.S. president and a leader of North Korea. The announcement came hours after Trump welcomed three Americans who had been held prisoner in North Korea back home on Thursday. The former prisoners arrived at Joint Base Andrews near Washington early in the morning. 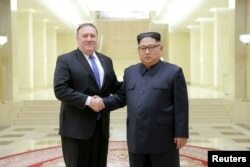 North Korea freed the prisoners after U.S. Secretary of State Mike Pompeo met for a second time with the North Korean leader. Trump and his wife, Melania, boarded the plane that carried the three men. The three then stepped out, shaking hands with the president and waving to media and military personnel. Trump said he believed Kim wanted to bring North Korea “into the real world” and he had high hopes for their planned meeting. Only months ago, Trump and Kim exchanged insults. However, tensions began to ease beginning with North Korea’s participation in the Winter Olympics in South Korea in February. Trump then accepted an invitation to meet with Kim. The three former prisoners are Korean-Americans. Tony Kim and Kim Hak Song were teaching at the Pyongyang University of Science and Technology. They were separately detained in 2017. North Korean officials accused the two of anti-state activities and trying to overthrow the government. The third detainee, Kim Dong Chul, was arrested in October 2015. He was sentenced to 10 years in prison with hard labor in 2016 after being found guilty on charges of spying. The three appeared to be in good health on their release. But they were taken to Walter Reed National Military Medical Center for additional medical examinations. The release followed a recent announcement by Kim that North Korea would suspend missile tests and shut down a nuclear bomb test area. American Vice President Mike Pence agreed. He told the CBS This Morning program, “What Kim Jong Un has said publicly and in discussions is that he is prepared to negotiate to achieve complete denuclearization of the Korean Peninsula. 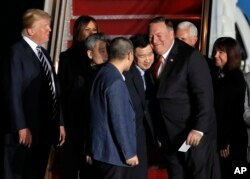 President Donald Trump, left, with first lady Melania Trump, watch Secretary of State Mike Pompeo, right, embrace former North Korean detainee Tony Kim, with Kim Hak Song, third from left, and Kim Dong Chul, front, May 10, 2018. Hai Do wrote this story for Learning English with additional reporting from Reuters. Mario Ritter was the editor.